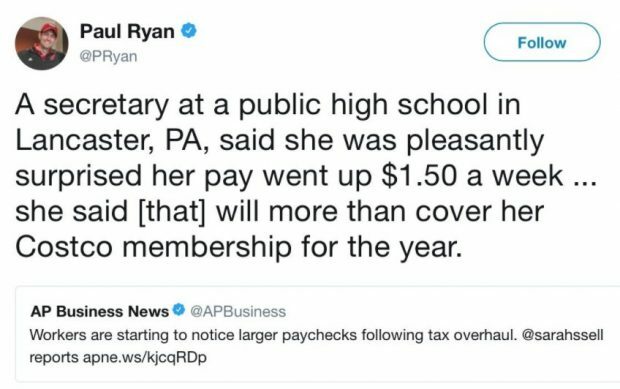 Paul Ryan, or at least his social media team, wanted to celebrate the fact that a High School secretary was pleased that her weekly pay check increased by $1.50 per week. But it appears that the secretary was being sarcastic rather than grateful. CBS News found the secretary Paul Ryan bragged got a $1.50 a week of his #GOPTaxScam. Check out the video below. And the twitter response was brutal. Thank you for the $1.50 in tax cuts you gave my family. #ThanksForNothingPaulRyan My daughter can now make a $6 dent in the the $200 a month health care increase your policies caused. Your crumbs are tasteless. The unkempt roadkill perched atop the Dork from New York’s head reanimated for a moment to give us a glimpse of what’s underneath. The republican weakness is that their policy, and decision making are just dreadful. 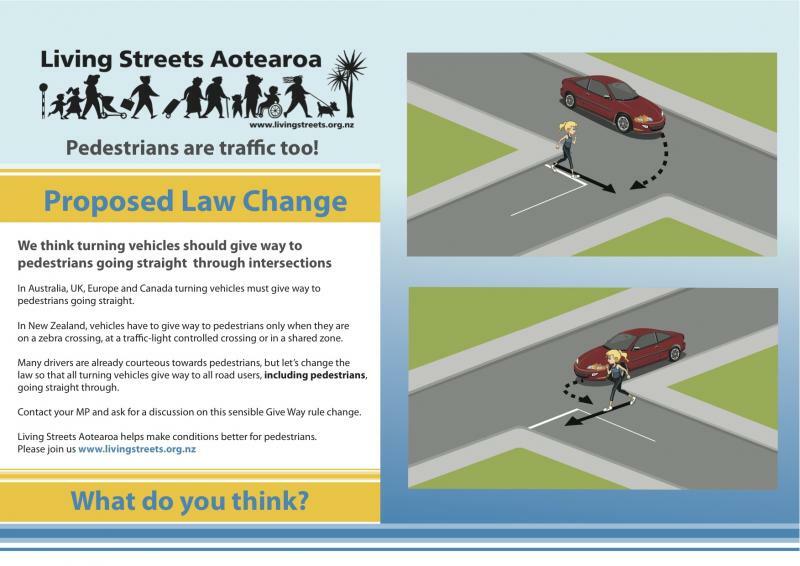 Their policy and decision making are disconnected from reality – just like National’s. There could have been a Sanders Presidency if the Dems primaries had not turned so dirty. Indeed stats show Sanders would have easily beaten Trump. Instead 12% of Dem supporters migrated over to vote for Trump as they did not want Hillary. Such is life in the oligarchical USA…. Take a look at Lee Camp on Youtube. Can’t remember which episode exactly but its there. Kinda need to do better at providing references (with all due respect). Saying it’s on some video is like saying I read it some book somewhere. Sanders lost the primary vote by a significant margin. He might have appealed to people on this site, but he needed to convince his own prospective voters. As for “turning dirty”, Sanders only joined the Dems so he could run on their ticket. He was always an Independent before that. I can understand why, in that situation, party officials and long term members might have been less than welcoming. US politics is always bruising. They play hard. Sanders didn’t get anything more or less than other candidates, in terms of rough treatment. In the U.S two party system you have to run either DEM or REPUB if you intend on actually becoming President. Sanders has worked and caucused with the DEM’s for years. If he had run as an independent he would still be getting the blame for Hilary’s loss because they would accuse him of sucking left wing votes away from the DEM nominee as they are still doing with Jill Stein. It was a classic damned if he did and damned if he didn’t case. It made far more sense to run as a DEM and if you win the nomination get the visibility that the primary provides and the backing in the actual race. As to not getting a hard time. It has already been shown that not only was Hillary fed questions leading into debates but she also had undue influence over how DEM funds were used during the primary. Bernie was probably never going to win that primary due to his low recognition and his being an independent, but to say that he got a fair shake and the DEM leadership didn’t put a finger on the scale in Hillary’s favour is just not accurate. Christ, some of this Sanders talk is tedious. the Dems primaries had not turned so dirty. You must have a pretty short memory. 2008’s Obama/Clinton primary was just as, if not more, nasty than 2016 and yet Democrats still came together ok. Instead 12% of Dem supporters migrated over to vote for Trump as they did not want Hillary. 9% of Democrats voted for Trump. Meanwhile, 7% of Republicans voted for Clinton. And, this is entirely within normal historical variation for the percentage of voters ‘crossing the floor’. On a related note, there’s a fascinating case study that shoots a big hole in the ‘Sanders would have won’ argument. In Colorado (a swing-state Clinton won by 5 points) an additional ballot measure proposing state-wide universal healthcare was utterly trounced. The proposal was strongly supported by Sanders and looked very similar to what he campaigned on rolling out across the country. This is a really bad sign for a Sanders nation-wide campaign. FYI who asks for citations on a blog? Just Google it. It took me 2-3 seconds to find this one ref. Did you read LITERALLY ANYTHING beyond the first sentence of that article? Off bloody topic, the past is over. The reality is trump won, attack that cretton on his policy and failed election promises. Sanders and the USA People got shafted big time by Billary Hinton. Trickle down never worked in NZ, so I doubt whether it would work in the USA, mind you getting an additional $1.50 per week is not to be scoffed at especially if you are on the bones of your arse.